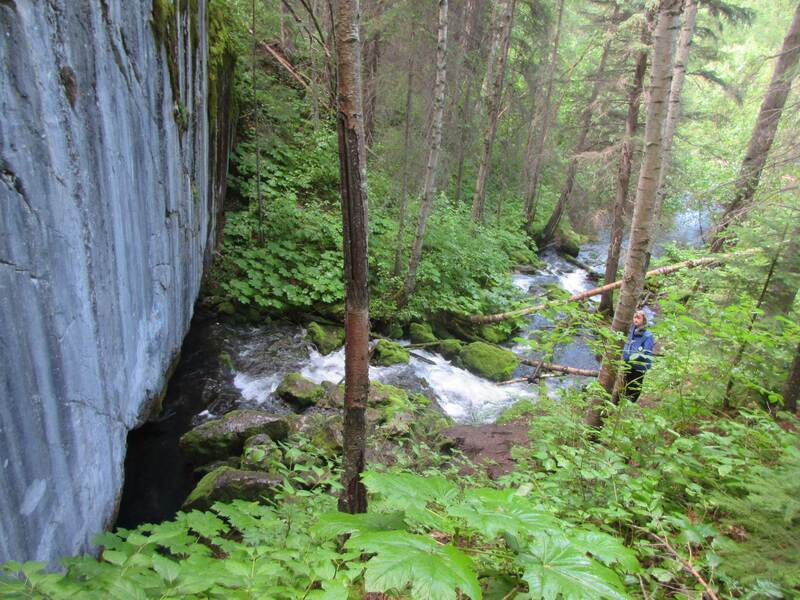 The drive from Tumbler Ridge to Hole in the Wall involves 69 km of pavement on Hwy 29, then 52 km of unpaved road up the Sukunka Forest Service Road (FSR). The last ten kilometres are rough. If the recommended side trips are enjoyed, the one-way distance is 160 km. En route there are many attractions: a wetland hiking area, three lakes, two waterfalls, and a resurgence spring, with three provincial parks. These form the seven suggested stops described in this guide. Short hiking trails lead to most of these attractions. 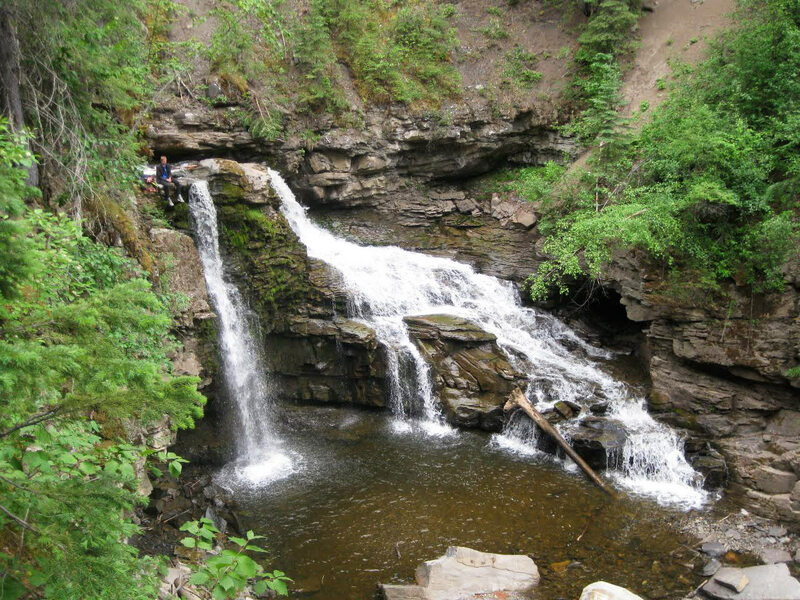 With the exception of Martin Falls, they lie within the Tumbler Ridge Global Geopark. 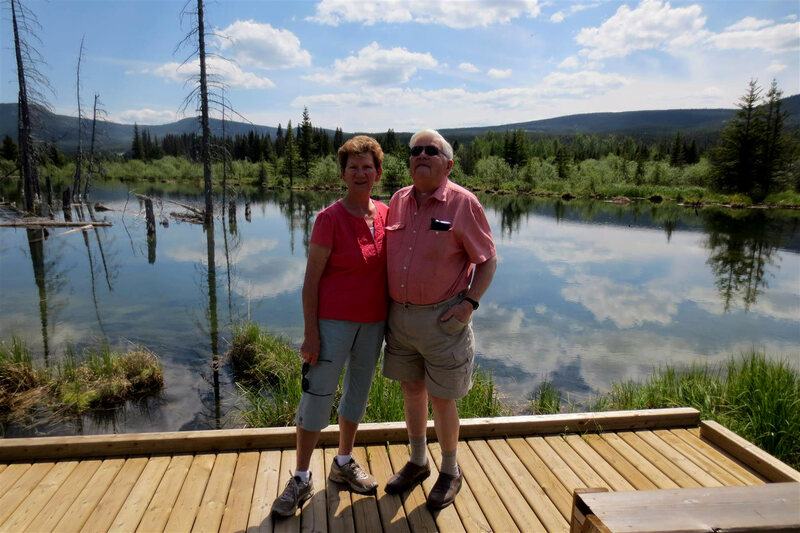 There is no circular route option, so it is necessary to return to Tumbler Ridge the same way, or to head for Chetwynd (21 km away) when Hwy 29 is reached on the return journey. Hwy 29 and the Sukunka FSR pass through pleasant foothills scenery of the Hart Ranges of the Rocky Mountains. The Sora Trail (250 m) and Bittern Trail (650 m) lead along boardwalks and trails to benches and viewing platforms overlooking this peaceful wetland and forest area with beaver dams. A bird checklist and trail brochure are available, and signs interpret the wetland habitats. Beyond Bullmoose Marshes Hwy 29 passes a turnoff to the left, which leads up the valley between Mt Spieker and Bullmoose Mountain to the old Bullmoose Mine, plus hiking routes to Cowmoose Mountain, Holzworth Meadows, Windfall Lake and Pinnacle Peak. 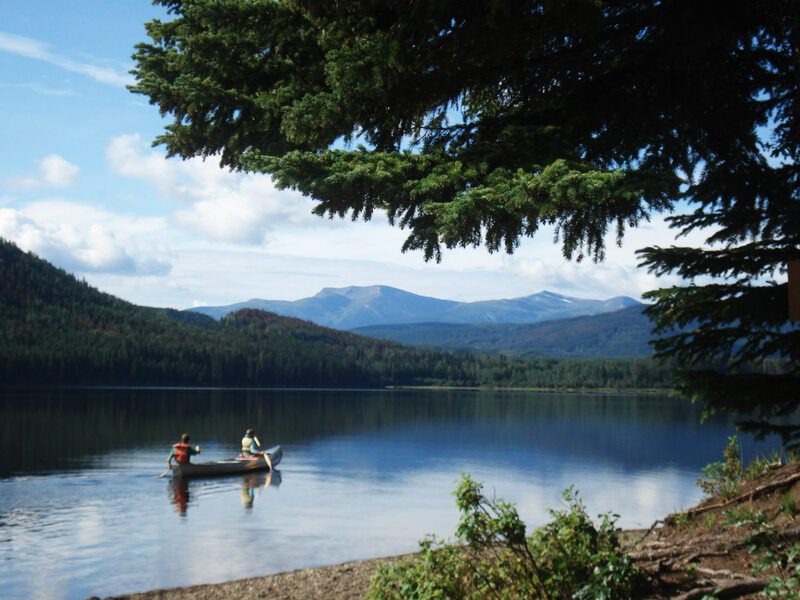 Next there is a turnoff right for just over 5 km to the recreation site at Moose Lake, popular for fishing and camping. As Hwy 29 continues into the drainage of Meikle Creek and descends into a wide valley, the next large turn-off to the left leads to the Meikle Wind Project – the huge wind turbines can be seen from the highway. Meikle Creek drains into Gwillim Lake, which is one of the bigger bodies of water in the region. Distance off Hwy 29: 600 m to viewpoint, 2.5 km to lake shore (paved). It is worthwhile stopping at the viewpoint on the right 600 metres after entering the park, where a panel interprets the history and features of the lake and park. Gwillim Lake was named after J.C. Gwillim (1868-1920), who conducted the first geological surveys in the region in 1919. Gwillim created the most accurate map at the time for what is now the Tumbler Ridge area, which included the first written mention of the name “Tumbler Range”. Mt Meikle, the summit above the far shore of Gwillim Lake, is a mountain of sandstone left behind when softer shales were eroded away by wind, ice and water after the formation of the Rocky Mountain foothills. 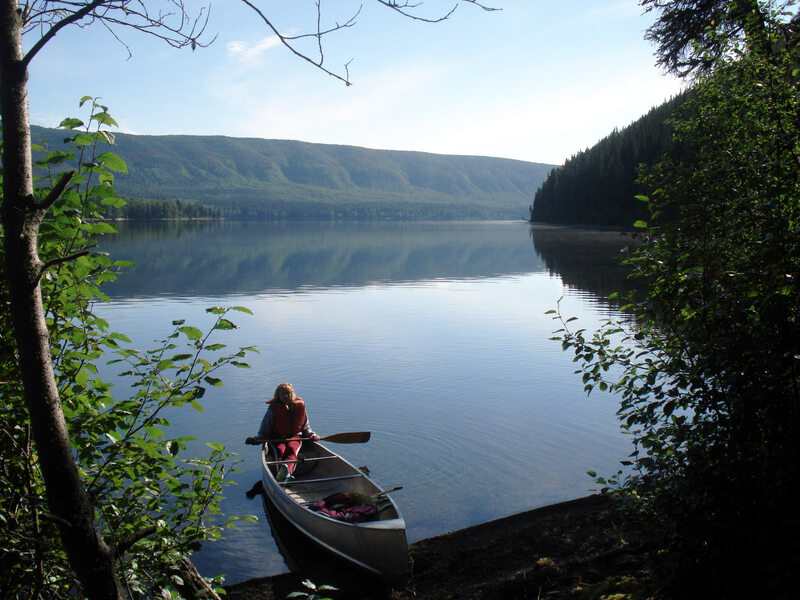 The basin scoured out below Mt Meikle filled with water, forming Gwillim Lake, which is now 10 km long, with a maximum depth of 48 m.
Twelve prehistoric First Nations sites have been identified along the shores of the lake. These sites typically contain lithic scatters, usually stone tools or the stone flakes created while producing these tools. Most are composed of regionally occurring quartzite or black chert, but flakes of basalt or obsidian are of volcanic origin and do not occur in the region. The obsidian almost certainly originated on Mt Edziza, in the Coast Ranges of northwestern British Columbia. These discoveries imply significant trade patterns amongst First Nations. One site that contained burnt bone and charcoal was radiocarbon dated to 3500 years. The horizon to the southwest is formed by Bullmoose Mountain. Its three summits and surrounding alpine slopes and cliffs are home to a herd of over fifty mountain goats. The highest of these summits is 2038 metres above sea level. The rock layers visible from the viewpoint are from the Cretaceous Period. Rocks in the region are generally stacked up in order, from the youngest in the northeast to the oldest in the southwest. Those that form Bullmoose Mountain are of the Gates Formation and are just over 100 million years old. They are therefore older than those that form Mt Meikle on the south shore of Gwillim Lake. Having enjoyed the viewpoint, proceed on down to the camping area and day use area on the shore of the lake. The Lakefront Trail (less than 1 km long, and rated easy) is a worthwhile short excursion. From the turnoff to Gwillim Lake Hwy 29 continues northwest, over another saddle, and enters the Martin Creek valley. After 15 km there is a turnoff to the left to Boulder Lake. The unpaved road winds through the Kwoen Hills, with occasional views of the mountains through clear-cut areas. After 17 km there is a T junction. Turn right down a very steep road, park before a puddle in the road unless you have a good 4 x 4, walk past the puddle, and look for the trailhead on the right. The trail leads for 350 metres past some large boulders to the peaceful lakeshore. 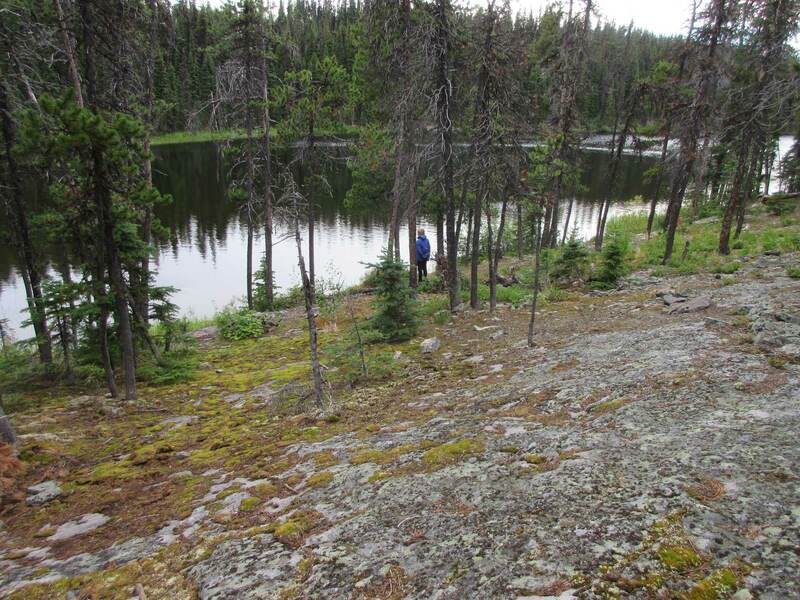 Boulder Lake has a near-perfect rectangular shape, being over a kilometre long and just 100 m wide. The lake fills the trough of a syncline: note the angle of the rock layers that line the sides of the lake in places to appreciate this. The northwestern end of the lake is the source of Boulder Creek. 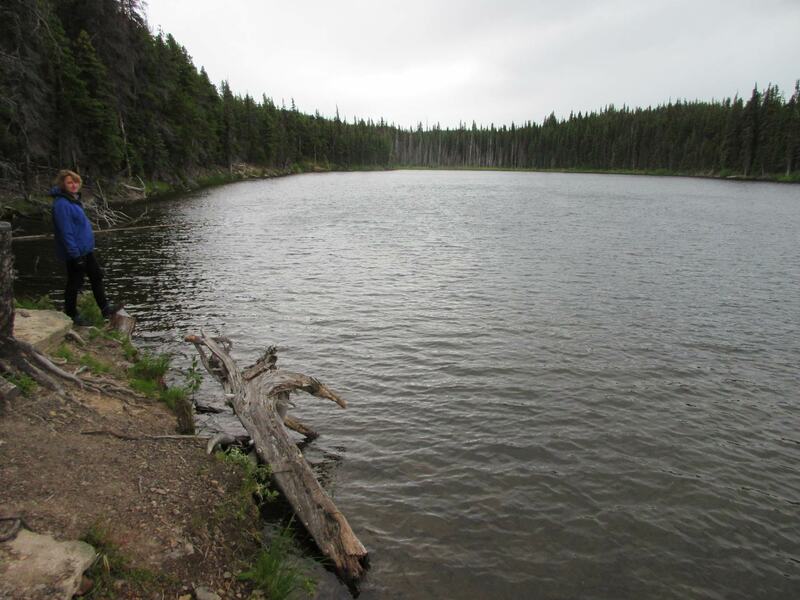 Boulder Lake is ideal for fishing from the lakeshore or from a canoe or inflatable, portaged in from the trailhead. The parking lot for Martin Falls is on the left side of the highway, 6.5 km from the turnoff to Boulder Lake and 21 km from the turnoff to Gwillim Lake. 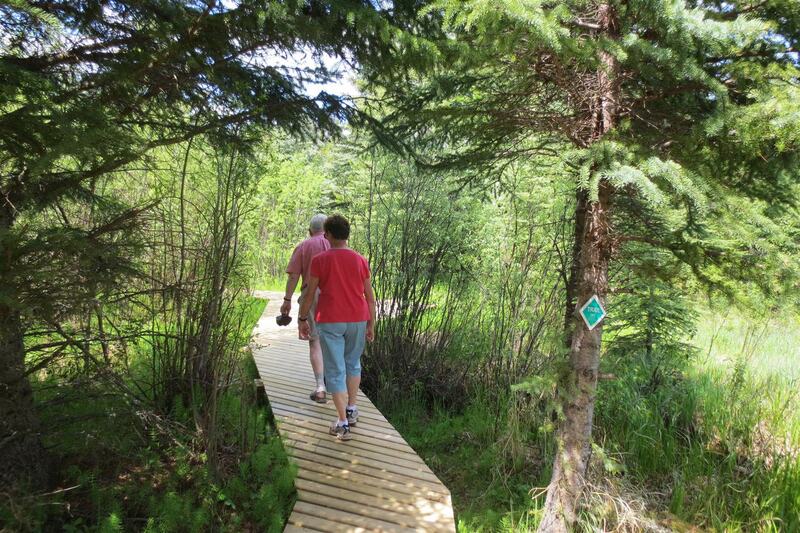 The hiking club in Chetwynd has done a great job of building a trail down into the canyon and to the falls (there are actually three successive waterfalls in Martin Canyon). From where the trail reaches the creek level it is an easy walk or boulder-hop upstream to the foot of the upper falls. Heading downstream along a spur trail or over bedrock leads to a viewsite of the middle falls, but caution is needed because of steep unprotected drop-offs. Martin Canyon is lined by rocks of the terrestrial Dunvegan Formation (97 million years old) – dinosaur tracks have been found in the canyon, and the rocks near the falls contain plant fossils. From the pullout for Martin Falls Hwy 29 continues down a long hill for just under three kilometres, after which the Sukunka Forest Service Road enters from the left. Turn left here, 68.7 km from Tumbler Ridge. At times when coal prices are high the Sukunka FSR can be very busy with industrial traffic. This is a radio-controlled road, with instructions to call kilometres when driving back (north). When the mines are idling the road is quieter, although the first 16 km can still be busy. Reset your trip-meter to zero at the start of this road. Reasonably accurate kilometre markers are present up to km 39. 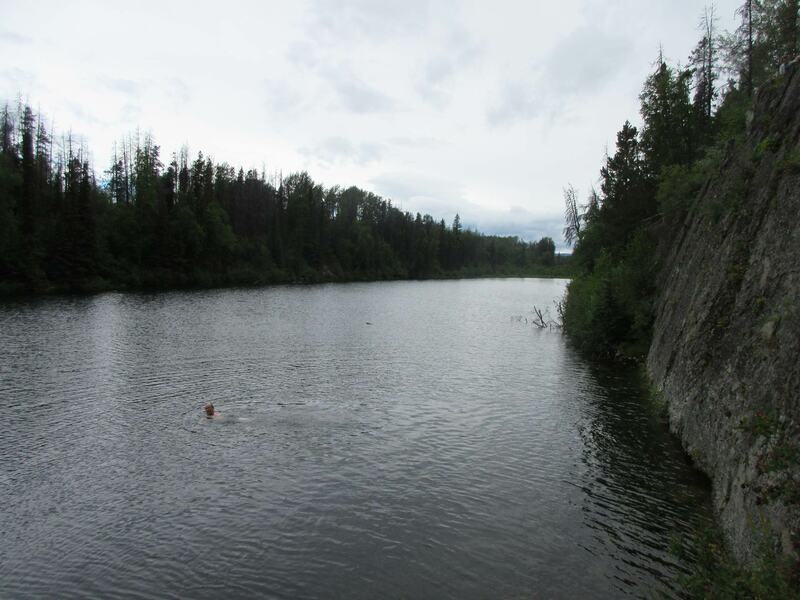 At km 12 there is a pleasant riverside stop beside a concrete structure, good for swimming in the deep pools beside the rocks. Distance off Sukunka FSR: 250 metres of steep, sometimes rough trails. 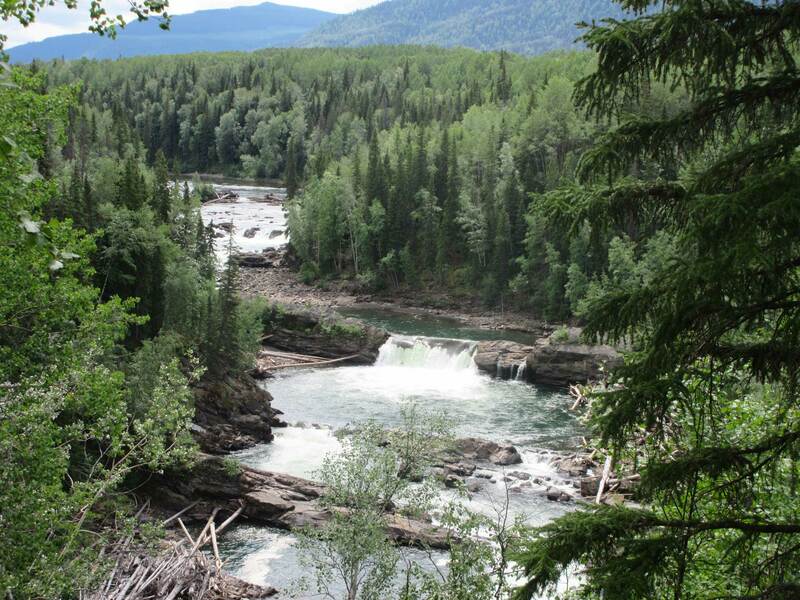 Sukunka Falls Provincial Park preserves the wildest stretch of the river. 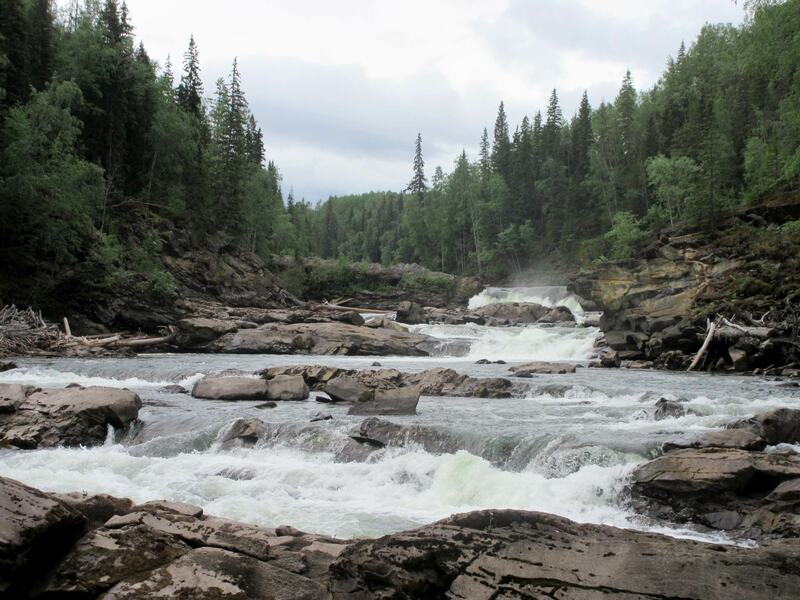 A series of falls and rapids have viewpoints and there is a short hiking trail down to river level below the main falls, with offshoots to the rapids upstream and downstream. The river tumbles over successive parallel rock layers of the Gething Formation from the Early Cretaceous Period (about 113 million years old) and the slightly older Cadomin Formation. The first pullout and parking area provide a good view of the falls, while the second, smaller pullout forms the trailhead. Fall is a particularly good time, as the colours of the aspen are spectacular. One dinosaur footprint has been discovered just below the falls, where there is a small sandy beach. At km 22 there are further falls, which can be glimpsed through the forest, with a very faint trail that leads very steeply to river level. At km 24 there are further rapids in the river which runs close to the road at this point, although there is no trail. At km 25 there is a big turnoff left to a natural gas plant. A hundred metres along this side road, and before the entrance to the gas plant, lies the start of the trail to Frosley lake, also known as Hidden Lake. This 4 km ATV route climbs steadily for a vertical gain of over 200 metres, to reach the summit of a high ridge. Hidden on the summit is a remarkable lake, which can be called “Boulder Lake on steroids”. Frosley Lake is 750 metres long, and less than 75 metres wide. Much of the shore is lined by steep cliffs of the Cadomin Formation, which dip at an angle of 80 degrees, forming a tight syncline. The lake fills this syncline and is very, very deep, and its shores are so straight and regular that it almost looks man-made. The trail emerges from the forest at the top of some of the highest cliffs. 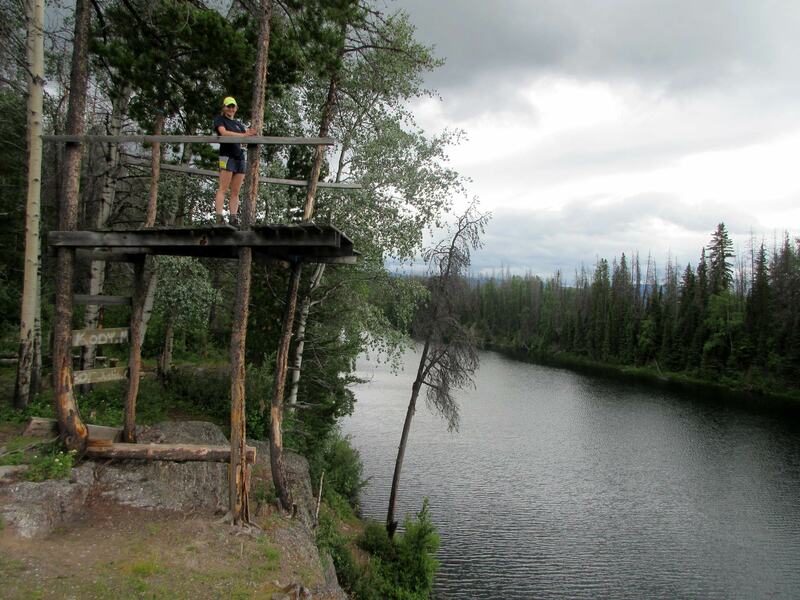 Here regional daredevils, not content with jumping off the ten-metre-high cliffs into the lake below, have taken it upon themselves to build an even higher jumping platform supported by trees. En route to Frosley Lake the trail passes a fine viewsite of the Sukunka Valley and surrounding mountains. While most suited to ATVs, the trail can also be used for hiking, mountain running, or for extreme mountain biking. An ankylosaur hand print was discovered right on the ATV trail. The Sukunka FSR continues up the valley, with a number of side roads that lead to industrial sites. Continue straight at all these junctions. Kilometre signs become less frequent, after km 39, and the road progressively becomes less maintained. At km 42 there is private land on the right, after this point the road needs to be driven slowly and with caution to avoid potholes. It can be driven without 4WD when conditions are dry, although moderately high clearance is desirable. Just before km 46 is the pleasant Windfall Creek Forest Recreation Site, with a few rustic campsites, fire rings and picnic tables. Just beyond this, after crossing the creek, the road verges on a nice stretch of river. The worst patch of road is a badly rutted, wet section at km 49. However, for those who make it this far, reaching and enjoying Hole-in-the-Wall is well worth the effort. Here a substantial clear stream emerges at the foot of a vertical blue-grey limestone cliff, and flows through the forest surrounded by verdant vegetation. The creek flows beneath the road after 40 metres. Driving up the Sukunka valley into the mountains, progressively older rock layers are encountered. The limestone cliff is from the Mississippian Period, between 359 and 323 million years old. In some other parts of the world rocks of this age contain the remains of ancient forests, and have yielded abundant coal resources. 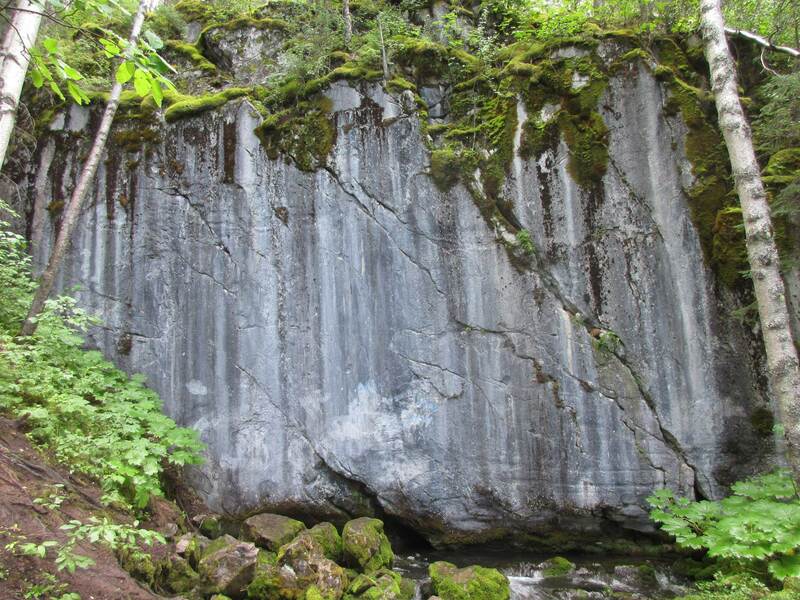 By contrast, rocks of this age in the Tumbler Ridge Global Geopark were formed from sediments deposited on the floor of a balmy, shallow sea, about 20˚ north of the equator, off the shore of the continent of Laurentia. Water in which carbon dioxide is dissolved forms the weakly acidic carbonic acid, which has the capacity to dissolve limestone rock. Surface water is rare in such areas, and most water drainage occurs through tunnels and channels in the rock deep underground. At the bottom of the limestone rock layer, if the underlying rocks are impermeable to the passage of water, this water may travel along the upper surface of the impermeable rock until it reaches the surface as a spring. Hole in the Wall is an outstanding example of such a resurgence spring. Flow rates are higher in spring but remain considerable throughout the year. As of 2015, no-one had yet attempted cave-diving into Hole in the Wall. Such an adventure would be for highly skilled experts only. A pair of American Dippers can be often be seen bobbing up and down on the rocks in the creek, or foraging in the water. They usually nest right above the spring in the rock cliff in June and July. Please do not disturb these birds when nesting. Having come this far up the valley, it may be worthwhile continuing another 4 kilometres up the Sukunka FSR to where it crosses the river, beside an attractive wilderness camping area. The Sukunka FSR goes much further into the mountains, but this is a remote area and the road deteriorates even further. 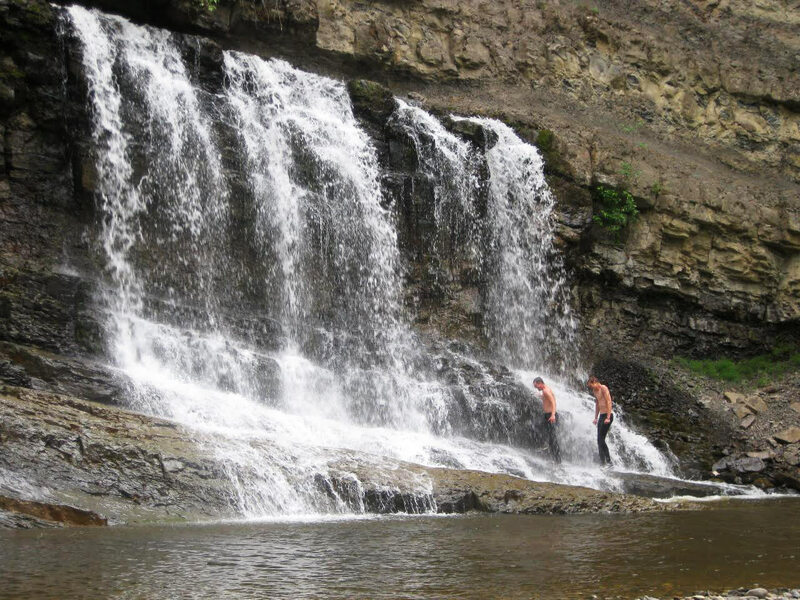 For intrepid adventurers there is a combination of excellent scenery, remote alpine lakes and mountain summits, caves, and such choice destinations as Burnt River Falls, Burnt River Cave, and the railway tunnels at the headwaters of the Sukunka River.